Every year, at CES, QNX Software Systems showcases its immense range of solutions for infotainment systems, digital instrument clusters, telematics systems, advanced driving assistance systems (ADAS), and in-car acoustics. This year is no different. Well, actually… let me take that back. Because this year, we are also announcing two new and very important software platforms: one that can speed the development of automated driving systems, and one that can transform how acoustics applications are implemented in the car. Pre-integrated partner technologies, including systems-on-chip (SoCs), vision algorithms, and V2X modules, to enable faster time-to-market for customers. Replaces the traditional piecemeal approach to in-car acoustics with a unified model: automakers can now manage all aspects of in-car acoustics efficiently and holistically, for easier integration and tuning, and for faster time-to-production. 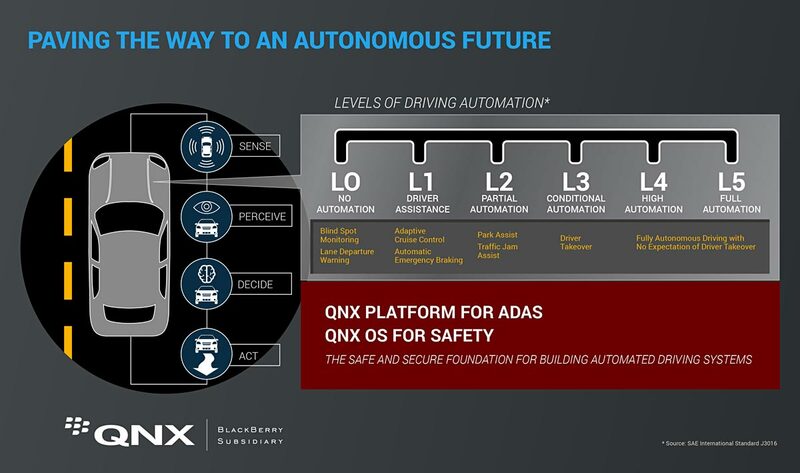 Integrates a full suite of acoustics modules, including QNX Acoustics for Voice (for handsfree systems), QNX Acoustics for Engine Sound Enhancement, and the brand new QNX In-Car Communication (ICC).